Way back in 2016 I did a post on award season gowns that looked vague Esmeralda-like in style. One gown I mention was this one worn by Zendaya. 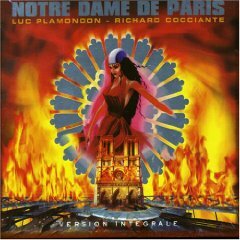 It looks very similar to the dress that Esmeralda wears on the poster/album cover for the Notre Dame de Paris musical. Anyway, I been a addictive to Pinterest and this came across my feed awhile ago. I can’t tell you how much this gown looks like it could have been made for the Norte Dame de Paris musical. It’s literally has all the elements of the original gown. This color, the cut, the shape of the sleeves (that it even has sleeves at all), the fact that there is a texture with the beading. Even hemline is on point. If this gown was the costume used in production or even just for a concert, I’d be happy. For the record, I do not think Zuhair Murad was inspired by Notre Dame de Paris at all, but it’s eerie . Honestly if there ever was large scale production of Notre Dame de Paris made for an American audience, be it a Broadway level production or a movie (one can dream), Zendaya would be a great choice fro Esmeralda. And after listening to Rewrite the Stars from The Greatest Showman, I really need her to sing Bohemienne, even if it. just a cover. Heck I’d like to see her as Esmeralda if Disney ever does a Live-action of Hunchback, again one can dream. Note – I Love Zuhair Murad designs. They are so pretty. I am new to the Hunchback of Notre Dame Fandom, and I can say that she would make a great Esme, for sure, she isn’t just beautiful, she is alluring, like mysterious and atractive, her looks also are very unique. I think she would be great as any Esme version, book or not, but she would be pretty wonderful as Disney’s Esme, she has something that screams girl power!